DinoCount1 The number of dinosaurs going down the left-hand pipe. DinoCount2 The number going down the right-hand pipe. DinoTotal The number coming out the bottom. 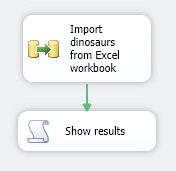 We'll use a Percentage Sampling transformation to split the data into two streams, wtih 50% of the dinosaurs in each. 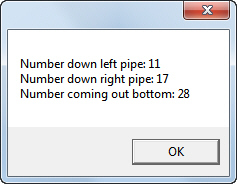 The Show results script should have 3 ReadOnly variables defined for it. Close this package, and say a joyful goodbye to dinosaurs for now!